As our newest cohort of alumni looks ahead to the future, let’s also take a moment to reflect on Commencements of the past. 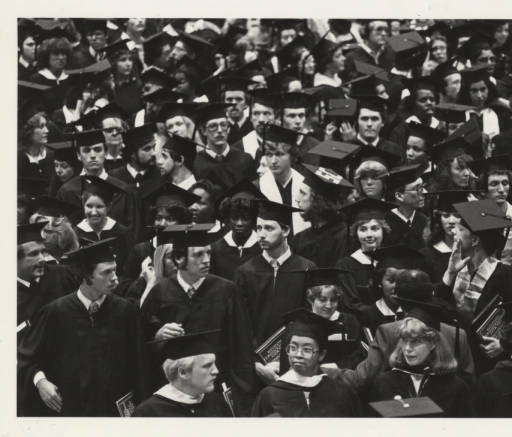 We hope you’ll enjoy this slideshow of UMBC Commencements through the years! Special thanks to UMBC Digital Collections for keeping our great university’s history so neatly organized for all to use. Please share your Commencement memories with us here or on Twitter using #UMBCgrad! We’d also love to add in Commencement photos from missing years; email them to retrievernet@umbc.edu, and we’ll add them to the slideshow! Nice pics! Where are the Graduate School’s commencement ceremonies? There was no graduation in 1967. Also no RAC, just the old gym. Could those pictures be the convocation? Thanks for your help! We’ll have to double check with our archivist on those photos. Previous Previous post: Congratulations to the Class of 2013! Next Next post: 30 Days. 30 Scholarships for Deserving UMBC Students.